Yesterday morning, the church service at First Baptist in Montgomery started the way so many church services start – with warm hellos and plenty of donuts and coffee in the church basement. But then I met an elderly man who told me he had been in that basement for 11 hours in May of 1961, along with hundreds of people, while a mob outside tried to burn down the church. This was Dr. Ralph Abernathy’s church, the Brick-a-Day Church. It had been a center for civil rights organizing, and a sanctuary for Freedom Riders and others in the movement who were under attack. The elderly man described the calls from the church phone, placed by Dr. King to Attorney General Robert Kennedy, asking for help. He said that at first Kennedy had promised to call out the National Guard, but the Guard was local, and many of those men were now part of the mob. The people trapped in the church needed the Army, and Kennedy promised to send it from a military base several hours away. So the man described what it was like to wait in the sweltering basement, listening to the mob outside. Four years after the siege of First Baptist, 25-year-old John Lewis had already faced beatings and threats as he prepared to march from Selma to Montgomery on March 7, 1965. On the day that became Bloody Sunday, the day John Lewis was beaten to the ground and his skull was fractured, he faced it fearlessly, carrying a backpack containing a toothbrush, an apple, and books on religion and politics. On Saturday, Bruce and I sat behind John Lewis on a bus from Montgomery to Selma to the ceremony honoring the 50th anniversary of that march – on the same road the marchers took from Selma to Montgomery. John Lewis pointed out every marker along the way: the airport where people arrived to join the march, the places where they camped, the hospital where people took refuge, until we reached the Edmund Pettus Bridge, where John Lewis had nearly died. John Lewis told us that his parents didn’t want him to get involved in civil rights. They didn’t want him to cause trouble. But he had done it anyway. Sometimes it is important to cause necessary trouble, he told us. In the past half-century, thanks to the necessary trouble of heroes like John Lewis, our country has made great progress – but not enough progress. There are those who want to take away votes, those who want to make it harder to get an education, and those who believe that justice and dignity are reserved only for some people. It’s up to us to build a future so that ALL of our children have the opportunity to succeed. We spent this weekend learning more about the civil rights movement and about the work to be done. It’s profoundly important work. But for me, this trip was also a chance to hear first-hand about courage and deep faith, about the certainty of what must be done, and about the willingness to take it on. 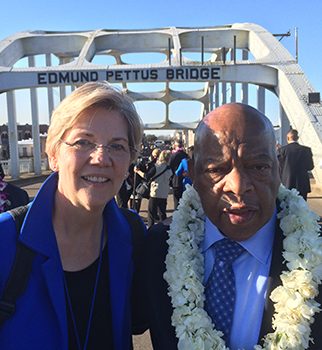 The power of Selma is hope – hope that change can happen. It’s not a passive hope, but a hope that demands that we make the necessary trouble that will build a better world.